The Standard Schnauzer is of German origin and the Miniature Schnauzer was bred from the Standard Schnauzer. It is said to have come from the mixing of Affenpinschers and Poodles with small Standards. The Miniature Schnauzer became a distinct breed in the year 1899. This breed has been bred in the United States since 1925 and have grown to be quite a popular breed. The American Miniature Schnauzer Club began in 1933 and the breed was accepted in the AKC in 1926. 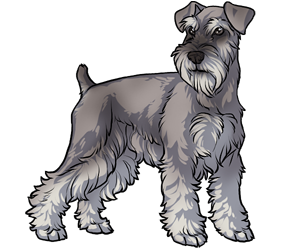 -The Miniature Schnauzer is the most popular of the Schnauzer breeds. -The Miniature Schnauzer was originally bred to be a small farm dog.